Huron Street Junior Public School hosted a community meeting in late January to discuss plans for revitalizing its playground. 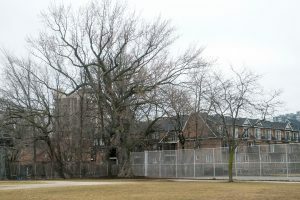 While upgrades to the yard are sorely needed, the school highlighted four points that could use improvement: the large and old “Big Tree” that they want to use as a gathering point for the school, the grass playing field that is uneven and has drainage problems related to its original foundation, the baseball diamond that has an uneven sandlot and may end up becoming a safety hazard, and the tennis courts that have been falling apart. The school is hopeful that funding can found so the revitalization can be completed quickly.